​As yet another quality fish finder made by V​​​​​enterior, the Portable Fish Finder with LCD Display (VT-FF001E) is quite similar to other devices of this type manufactured by the same company. And that's not a bad thing - the fish-finding equipment of this manufacturer is very popular with the outdoors enthusiasts, and for a reason. It's a compact, well-designed and a very useful device that everyone can afford, offering a lot of valuable features and being capable of helping you find fish up to the depth of over 300 feet. Let's see if it's worth the money! As yet another quality fish finder made by Venterior, the Portable Fish Finder with LCD Display (VT-FF001E) is quite similar to other devices of this type manufactured by the same company. And that's not a bad thing - the fish-finding equipment of this manufacturer is very popular with the outdoors enthusiasts, and for a reason. It's a compact, well-designed and a very useful device that everyone can afford, offering a lot of valuable features and being capable of helping you find fish up to the depth of over 300 feet. Let's see if it's worth the money! This model comes with a single-beam transducer. Some might see this as a serious disadvantage since the dual-beam fish finders are a new standard, but this can still do the trick. One shouldn't forget that he can't expect too much in this price category. The 45-degree angle beam of this model is capable of spotting fish that are located at depths from 3 feet (0.9 meters) to 328 feet (100 meters), which is, in our opinion, quite impressive for such a small device. This means that the VT-FF001E can be quite helpful when it comes to locating fish in the relatively deep water bodies. The control unit and the transducer are connected via a 25ft cable. This allows several different applications - one can cast the transducer from a pier, attach the device to his boat (by using the mounting tabs), or even connect the sensor to a handle and then simply lower it into the lake, river, or the sea. We should also mention the presence of a removable transducer float, complete with a rubber stopper. ​Unfortunately, the transducer isn't capable of reading the water temperature, but that's something we expected from a model in this price category. ​As you can already guess, this transducer that we've mentioned spots targets that are moving, which means that it doesn't deliver information on underwater structures and objects. Besides that, you won't be able to use it to detect your bait. But when it comes to fish, the VT-FF001E works flawlessly - it efficiently spots any fish larger than 10cm in length. One can regulate the size of the fish that the device will detect by adjusting the sensitivity settings. Unfortunately, the display doesn't show the size of the fish, no matter which sensitivity setting you decide to use. One other thing worth mentioning is that it's quite important to keep a low speed when you're in a boat with it - if you go over 5mph, the sonar transducer won't work correctly. ​The VT-FF001E sports a simple b/w anti-UV LCD display with a green background light. The fact that this is a colorless display doesn't have an adverse effect on its visibility - one can easily read the information that it delivers even in direct sunlight. And when it comes to information, it shows just a couple of things, like the depth and the position of your prey. It's capable of displaying the depth in either feet or meters, and that's pretty much it. For an affordable model such as this one, that's more than enough. The absence of colors is not as critical as it would be on the premium models that deliver much more info. If nothing else, the display of VT-FF001E removes the struggle of distinguishing between the underwater structures and individual objects. There's a bright side to everything! A much more significant downside is the fact that this model doesn't save your settings - you'll have to set each parameter again every time you turn the device on. The VT-FF001E sports a simple b/w anti-UV LCD display with a green background light. The fact that this is a colorless display doesn't have an adverse effect on its visibility - one can easily read the information that it delivers even in direct sunlight. One thing is certain - no one will have much trouble with figuring out how this thing works. And the reason behind that is the presence of just four simple buttons, which are On/Off, Enter, Setup, and Ft/M. Via these buttons, the user can regulate things such as the sensitivity, the measurement units, battery-saving mode, and others. Those looking for simple controls will find that the Venterior Portable Fish Finder with LCD Display is an excellent choice. Since this is a simple fish finder, there's no need to worry about complicated controls or unclear data on the display. One only has to place 4 x AAA batteries inside of it, turn it on, choose a sensitivity setting, and cast its transducer into the body of water. It's as simple as that! Since this is a budget-friendly model, one cannot expect it to deliver much information on its screen. Unlike the premium fish finders, the VT-FF001E won't show you things like the bottom outline or the weeds - just the location and the depth of the fish. ​Every time you turn the device off, your settings will be wiped - and you'll have to do it all over again. This actually isn't such a serious issue, as the model doesn't have too many parameters to set in the first place. Every time you turn the device off, your settings will be wiped - and you'll have to do it all over again. This actually isn't such a serious issue, as the model doesn't have too many parameters to set in the first place. ​The performance of this model is quite an impressive one, especially when we consider how affordable it actually is. The Venterior Portable Fish Finder with LCD Display offers simple controls, useful settings, and it has a compact build that makes it highly portable. It's yet another great model from Venterior, and one that we can heartily recommend to our readers - particularly to those looking for a budget-friendly fish finder. The performance of this model is quite an impressive one, especially when we consider how affordable it actually is. 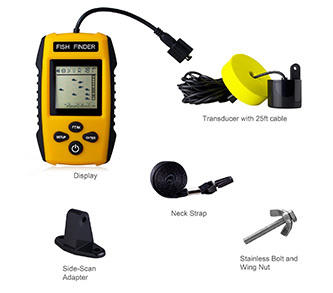 The Venterior Portable Fish Finder with LCD Display offers simple controls, useful settings, and it has a compact build that makes it highly portable. It's yet another great model from Venterior, and one that we can heartily recommend to our readers - particularly to those looking for a budget-friendly fish finder.